I've been thinking about the best paid survey panels. The panels that are often worth bothering with when you're someone who doesn't even normally spend a lot of time on paid surveys. I have certain criteria for the best. To me, the panels that are superior pay in cash, pay relatively fast, and might even offer products to test. They also don't make you take half the survey before booting you out, saying you don't qualify. I generally don't like survey panels that pay in points unless you can convert the points to cash. And the absolute worst are the survey panels that expect you to spend 30 minutes on a single survey and give you nothing more than a sweepstakes entry in return. 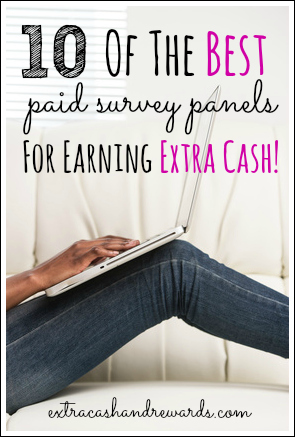 Now that that's out of the way, here's my top 10 list of the BEST paid survey panels. This panel is one I'm actually just learning about even though it's been around since 2011. They pay in Paypal, Amazon, or Visa cards. The pay is also instant if you select that you want a virtual reward rather than a mailed reward. So far, OneOpinion has great feedback from users. They are paying out as promised. Go here to sign up for OneOpinion our read my OneOpinion review to learn more about it first. I like Opinion Outpost because while they do pay in points, they convert to cash. Also, they now have a Paypal option and the cashout is pretty low. They're also known for paying very quickly, which is always a plus. I'm listing Pinecone first because they are one of the oldest and also the best. If you take a survey for Pinecone, you'll get paid within a day of you have the Paypal option and within a week if you've chosen check payments. Also, you're pre-qualified into every survey you get so there's no answering questions and then getting booted out after spending ten minutes. Another great thing about Pinecone are the products you sometimes get to test. Almost every survey you take ends with an opportunity to possibly to get in on a good product test. Paid Viewpoint is a newer panel created by the people behind Instant Cash Sweepstakes. They really got it right when they made this site! The surveys are short, you get paid some change for each one you take, and when you reach cashout (currently set at $15), you rarely have to wait more than a day for your money to come. The only semi-negative here is that, unless you have quite a few referrals, it might take a while to get to the $15 cashout because it's rare to earn more than $1 for each “biz” survey. The “traits” surveys only pay .10 cents each. MySurvey is another panel that is old and reputable. They do pay in points, but you have the option to redeem them for Paypal cash as well as lots of different gift cards. Another thing I like about this panel is that most of the surveys give you a lot of points if you qualify to take the whole thing, so it doesn't take too many completed surveys to get your $10 to Paypal. If you don't qualify, you'll know fast. As I can recall, they don't waste a lot of your time making you answer questions and then booting you out with no reward. Product tests are a possibility with this panel, too. This is a panel I used to be a member of, and my experience was positive. First and foremost, Survey Savvy pays you in cash money and there is no high cashout threshold. You can redeem at any time. You never know how much each survey will be worth — some actually pay pretty well while others are on the lower end of the scale. Survey Savvy is also old, reputable, and open worldwide. This company also has a good referral program. Mindfield is another reputable panel that has been around for many years. They pay you in cash (no points), and you only need $5 to cash out. I can't speak for everyone, but I tend to get a good bit of Mindfield surveys in my inbox. Other people complain that they send surveys too infrequently. Currently Mindfield is only open to US residents, but you can take surveys as young as 13 and up. I've never used this panel, but I've heard good things about them from others. Apparently they have a Paypal option for the surveys you take as well as Amazon. They also pay pretty quickly. This is an excellent survey panel. They pay in points, but the points convert straight to cash. It takes 375 points to get $10. Unfortunately, you can't just sign up on their site. You have to be referred by an existing member to get in (and unfortunately I am no longer an existing member so I can't help you out). Another old, reputable survey panel that pays in points that convert to cash. They pay on time and tend to send out a lot of surveys to take. This is a panel I am currently a member of, and I've always had a good experience. The surveys didn't seem to be annoying like they are with so many other panels, and they pay pretty fast. I always got check payments and it normally didn't ever take more than a few weeks for my check to come in the mail. I would love if you would chime in! What kind of experience have you had with these panels? Do you have any other survey recommendations? Ipsos I-Say has been good to me. I have received pay from them a few times, even though I don’t do too many surveys for them. I had a bad experience with Mindfield (never qualified for their studies) and Opinion Outpost (they didn’t do PayPal at the time though). I just tried to click on the Survey Savvy link and it took me to VIP Voice instead (which does not offer cash). I then went to surveysavvy.com and that looked liked the website you were describing. Thanks for letting me know! I’ll see if I can fix the link. I am a member of most of these…I do not care for mindfield or global very much since i rarely qualify for their surveys anymore..Pinecone is great and so are survey savvy and viewpoint forum.